I hate raisins with a passion. 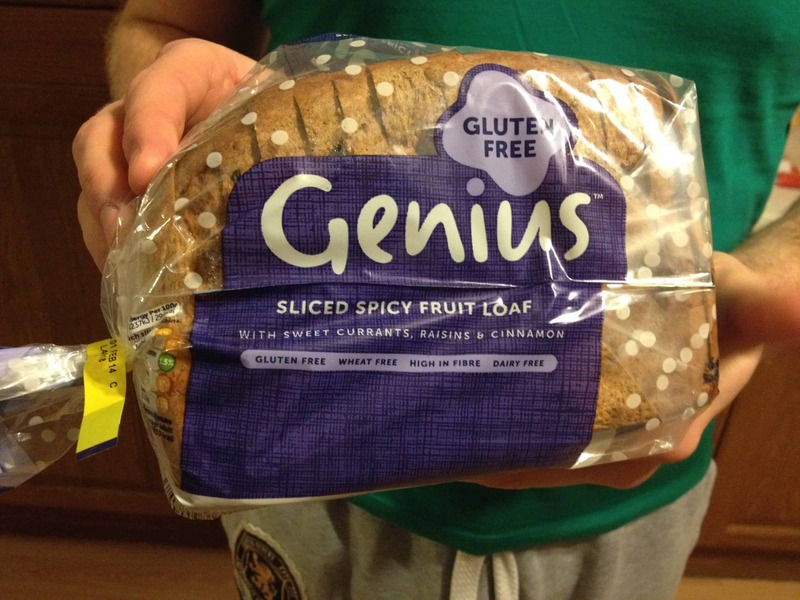 Which is why I was as shocked as anyone else to find I not only liked Genius’s brand new sliced spicy gluten free fruit loaf – I loved it. 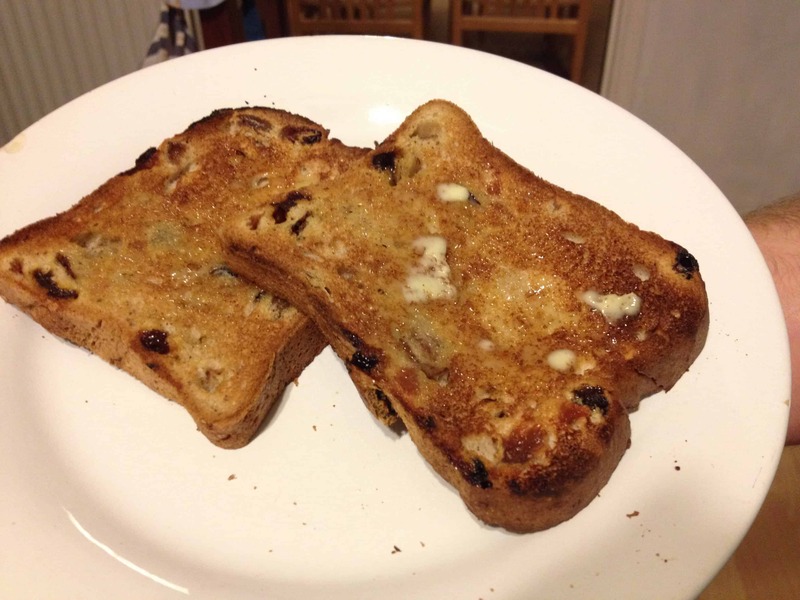 I seem to have turned into this fruit-loaf guzzling machine, popping a piece in the toaster every time I walk past and it catches my eye, staring at me, pleading, ‘eat me’. Genius very kindly offered to send me some of this to review. I was intrigued but was adamant I wasn’t going to like it and it would lurk in the back of my freezer until I couldn’t take the guilt anymore and threw it away. Or fed it to the birds. Instead, I warily toasted a bit, slathered it with butter and instantly fell in love. There’s something about it – sweet but not overpowering, faint hints of warm spices wafting from the toaster, and even that sweet burst of a usually-dreaded raisin or currant. I am befuddled by this bread. The texture itself is delicious. I think Genius has only improved over the years and (in my mind at least) you could almost be conned into thinking you’re eating real toast. I haven’t tried any of this untoasted, needless to say Steve and I sat by the toaster until it was all gone, and now I only stare at the Genius-shaped hole on my worktop. You can pick this product up at Tesco, Sainsbury’s, Waitrose or the Co-Operative, RRP £2.99. It’s still ridiculously pricey for a loaf of bread, but I would certainly recommend it as an occasional treat. As well as being gluten free it is also wheat, dairy and egg free and suitable for vegetarians. Win. It is quite good, but my all time favourite is Livwell Breakfast Loaf. Australian make but have seen some here in UK. Loaf is fruity, with pepitas and sunflower seeds too to give the bite and flavour. Yum. Ps. Enjoy reading your blog but, gosh, you are very brave in where and what you eat! I know so true! I don’t have a gluten free toaster at home so I don’t even get to that stage and i can eat a whole packet RAW! I don’t care about raisins and I hate fruit cake. What are you putting in thus stuff Genius??? You should get some toaster pockets from pound land, they make any toaster a gluten free one, the bread looks good. Is it very cinnamon as I am not a lover of the Christmas spices. it wise. I can not wait to read much more from you. This is actually a great web site. Re toaster, I vest in a coup,e of toaster bags which are also handy for self cater I g holidays! My big addiction is Live well Breakfast Loaf, spicy, fruity, full of seeds and oh so yummy.